Have you heard about tart cherry juice and its possible health benefits? Tart cherries, also known as sour, or Montmorency cherries, are light red in color and extensively used in pies, jams and preserves. They also can be dried and sold as pure juice or juice concentrate. 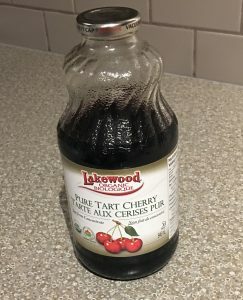 The bottle of tart cherry juice in the photo above contains juice from about 3 pounds of cherries and retails for $13 here in Calgary. It tastes like one would expect it to taste – like a tart cherry! It reminds me a bit of pomegranate juice in flavour. I’ve heard multiple people talking about this juice recently and found many posts online discussing the health benefits of pure tart cherry juice. In the post 10 Health Benefits of Tart Cherry Juice, author Alina Petre, MS, RD (CA) outlines many potential benefits of this juice. It is interesting to note that despite referencing scientific journals, studies and databases, she still uses the words “may”, “might” and “could” when describing tart cherry juice health benefits. What are some of the potential health benefits? If you would like more details, please read Alina Petre’s post. Are there negative side effects from tart cherry juice? It order to possibly benefit from tart cherry juice, the daily suggested dose seems to be 1-2 cups per day. According to the label on the bottle in the photo, that is 130-260 calories, 30-60g of carbs (22-44g of sugar). Those calories do add up if one is watching their weight. Also, tart cherries contain sorbitol, a type of sugar alcohol that can cause stomach upset. Based on the information above, I’m going to give it a try and see if it impacts my recovery after hard sessions and / or improves my quality of sleep. Seems like there is lots of upside for this tasty drink!